Honestly, my boy won't go near this book, so despite the cherub faced cuties and the happy ending, this famous old witch happens to be the most feared literary character in the house. Maybe it is the abandonment he has issue with, but me thinks it be the fact that she wants to eat children that freaks him out. I bought this book six months ago, and we've only had one reading. Whenever I pull it out, the boy turns his head away and screams NO! 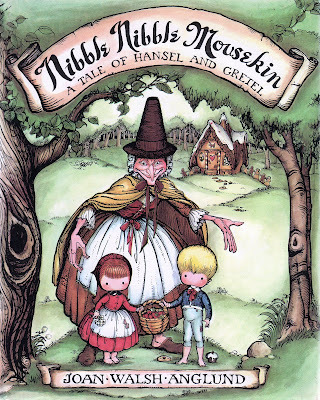 I never had a problem with Hansel and Gretel when I was wee. I rather liked the romance of the children being lost in the woods and finding a candy house and then the outsmarting and ultimate escape. But maybe three years old is a little too young for this sort of spooky mystery. Still, as usual, the pictures are excellent and the retelling of this classic tale highly effective in the creeeeeepy department. The wicked witch yanked Hansel out of bed with one bony hand and dragged him off to a cage. There she locked him up and left him, although he shook the bars and screamed loudly to be let out. Then she came back and shook Gretel roughly. "Get up, little lazy bones, and cook something for your brother. He's much too thin, but if we feed him well, what a plump, tasty meal he will make. 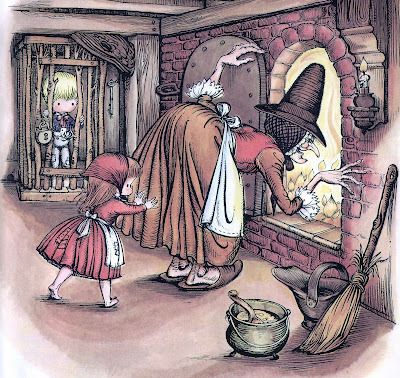 I always loved the imagery of Hansel sticking out the chicken bone when the witch wanted to see how fat he'd grow. For some reason, I always though that moment so wise and tricky, and it made me beam with pride for the little boy and his smarts. Perhaps someday soon, my son will grow up just enough to understand the moral here, but until then... Happy Halloween folks!